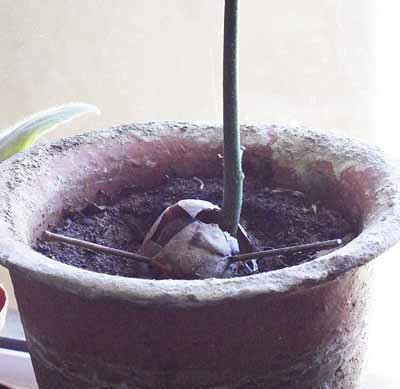 An avocado tree grown from a pip, about five months old. Everybody loves eating avocado pears and to boot they are pretty healthy fruits to eat. Once you have finished eating your pear you are left with the stone or pip which usually gets dumped in a bin. 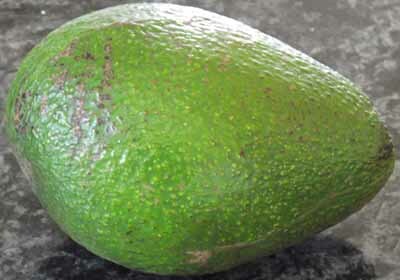 Next time you eat a pear that tastes really nice why not save the pip and grow yourself an avocado pear tree from it. It's so simple even a three year old can do it. He/she should be able to eat the fruit of their tree when they are 10 or 11 if all goes well with the tree over the next seven years. However, let's not get ahead of ourselves, we can't eat our own home grown avocado pears unless we have our own mature tree. So here is what we need to do to have a fruit bearing avocado tree in 7-10 years. Tallish beer glass or coffee mug or clear glass jar with hole big enough for the pip to fit into the jar. Four tooth picks or you can also use three inch panel pins. Window sill somewhere in the house where the pip can get indirect light. Clean the pip by rinsing it under the tap. Wash any pulp left over off. Dry the pip on a paper towel. You are now ready to insert the tooth picks or panel pins into the pip. Turn the pip so that the pointed end is pointing upwards. Imagine a circle drawn around the pip just above half way measuring from the bottom of the pip. Push a toothpick into this circle and then push another one into the same circle directly opposite the first one. Now find the half way mark on both sides of the pip between the two toothpicks you have already pushed into the pip and push toothpicks into the pip in these two spots on the same circle or level. I normally push the toothpicks into the pip so they are facing slightly upwards and not level as this will allow the pip to hang deeper into the jar and will stop you messing water all over the place when you are filling or moving the jar. Your pip should now look a bit like a sputnik. Now take the pip and place it in the mouth of the jar so that the toothpicks are resting on the lip of the jar with the point of the avo pip pointing upwards. Fill the jar with water so that about two thirds of the pip is covered by the water. Place jar on a window sill and monitor the water level from day to day. This is a slow process so don't expect things to happen overnight. In about four to five weeks you should start seeing the pip start to split open and a small root appearing at the bottom end of the pip. The root will get bigger everyday. 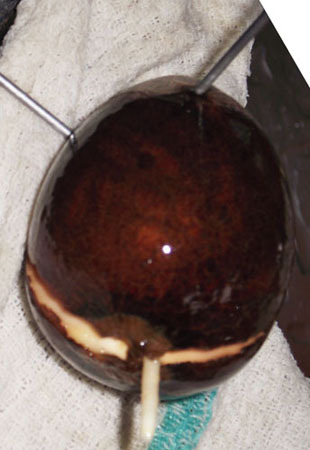 Shortly after the root appears a stem will start showing at the top of the pip. In a week or two this stem will be a few centimetres tall and start growing leaves. You can leave it in the water for a few days longer until the tap root is a bit longer. 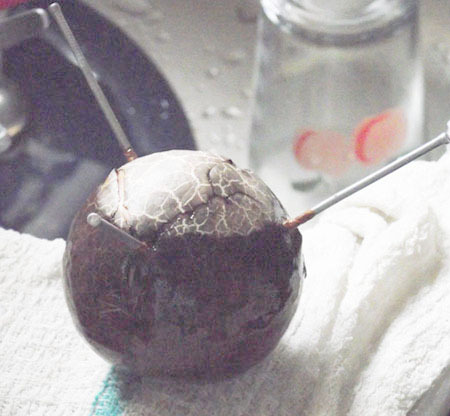 Preparing to plant the avocado plant in a pot. Once you feel the plant is ready to be planted in soil select a largish pot, about 20 centimetres in diameter and about 40 centimetres in height. Ensure that there are drainage holes at the bottom. Put in a layer of crushed stone across the bottom (5cm) above that a layer of river sand or white sand (5cm) and then above that you will fill in with potting soil. The stones and the white sand are there to assist drainage in the pot. Add a layer of potting soil on top of the sand. Take your avocado plant out of its jar and hang the roots into the pot so that they are touching the layer of potting soil. If you find that the roots are too short and the tree will get lost in the pot just add potting soil until you get the levels right. Now holding the plant in one hand fill in around the roots until the soil reaches the pip. Lay the pip on the potting soil and fill in around the pip until it's covered up to the level of the toothpicks. You can remove the toothpicks if you want to but this is not necessary as they will eventually rot and disappear on their own..
Water the soil in the pot until it is properly moist. It's not necessary to turn it to mud. At some stage in this process of watering water should flow out of the bottom of the pot. Stop watering when this happens as all the soil in the pot should be moist at this stage. You can press down on the soil now to consolidate it around the roots. A 15 month old tree which was grown from a pip. Place the pot in a nice sunny spot where it does not get too hot. A covered patio will work fine. Keep the soil in the pot moist at all times by watering regularly. Your avocado tree will reward you by growing up big and strong.